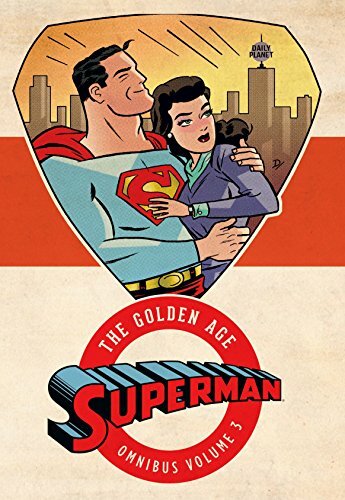 Superman: The Golden Age Omnibus, Volume 3 is the third installment in the Superman Omnibus series. It is comprised of Action Comics No. 48–65, Superman No. 16–24, and World’s Finest Comics No. 6–10—a delightful assortment of comic books penned by various and sundry DC writers. Then there is Doctor Menace, a plastic surgeon who promises his hapless victims the face of Adonis but instead gives them a hideous visage they’ll never lose unless they do his evil bidding. And of course there’s The World’s Meanest Man, whose sole desire is to “smash underprivileged youth’s chances for happiness” by stealing money earmarked for a vacation farm. There is even an episode where the most sinister thing the bad guys can think of is to create an “astrology controversy” to prove that astrology is . . . well, fake. The cases highlighted in this volume (“the terror from mars;” “the insect terror;” and “the case of the funny papers crimes,” to name a few) that probably left readers nail-bitingly unnerved in the early 1940s seem sweetly naïve in comparison to the real-life terrors people face in today’s uncertain world. Although victims are run down in the streets and villains are socked in the jaw, head-butted in the gut, or even shot by assassins’ bullets, there is never any blood, no one’s hat ever gets knocked off, and no one’s immaculate suit is ever wrinkled. It is rare that anyone actually dies in these selected volumes, but if they do, they die nicely and neatly, face down, with no muss, no fuss. This book is hours and hours of just plain fun. It’s also full of laughs. There are words like egad and phantasmagoria, and villains who look like lightning bolts and lizards. Since the volumes were released during WWII, it is also important to mention that there are several politically incorrect images, including caricatures of kamikaze pilots. But other than a few negatives here and there, it is safe to say that this book has something for everyone. Great for supplemental independent reading or to acquire as a collector’s item.